The New York Sun reports that the Mongolian government is finally ready to get to work. Following the protests of the July 1 election, the minority Democratic Party refused to attend sessions of Parliament. Without their presence, the majority MPRP could not establish a quorum to begin work. Now, Elbegdorj Tsakhia, leader of the Democratic Party, has relented. He continues to allege voter fraud, claiming that the DP should have won 64 seats, instead of the 28 they were awarded. Although international observers declared the election fair, Elbegdorj says fraud was endemic. Some people voted as many as 18 times, he alleges, and, because the MPRP controls the electoral process, little was done to police the situation. Polls show that most Mongolian voters believe the election was unfair. Of greater concern, though, were the post-election activities of the government. During the state of emergency, all private television channels were silenced, allowing the MPRP to have greater influence over public opinion. Elbegdorj even suspects that a fire set at the National Modern Art Gallery was a deliberate attempt to frame the DP. Naturally, the MPRP denies any involvement with the fire. “You can’t think of a more stupid thing,” says the general secretary of the party. In order to convince the DP to return to Parliament, some concessions were made. A subcommittee will investigate the fraud allegations, and the state prosecutor’s office will look into possible abuses by the police during the protests. Some police officers have already been charged with shooting protesters. Coca-Cola has just spent 22 million dollars to build a new six-hectare manufacturing plant in Mongolia. Coke has enjoyed a 50% annual growth rate in the country; they supply direct employment for 3,500 people and perhaps indirect employment for as many as 35,000 suppliers and business partners. Badar-Uugan Enkhbat has won Mongolia’s first-ever gold medal in boxing, winning the bantamweight final over Cuba’s Yankiel Leon Alarcon. The score was 16-5. Enkhbat took a 4-1 lead in the first round and easily held off Alarcon, in front of a sizable Mongolian crowd in the Workers’ Gymnasium. Enkhbat, born in Ulaanbaatar in 1985, had previously won the silver medal at the international championship. Mongolia missed its shot at a third gold when China’s Zou Shiming defeated Serdamba Purevdorj in the light flyweight category. The fight was stopped in the second round due to an injury to Purevdorj’s shoulder. This was Mongolia’s first Olympic silver medal in boxing. On Sunday afternoon, the people of Ulaanbaatar took to the streets to celebrate the two medals. Public screenings of the matches drew crowds, and people gathered in homes to watch the broadcasts on any of four channels airing the fights. Following the wins, the streets were filled with people shouting, giving high-fives, and waving the Mongolian flag from car windows. Both China and Mongolia made history by qualifying fighters for an Olympic boxing final for the first time – and in Mongolia’s case it was at a Games where judoka Tuvshinbayar Naidan won the country’s first ever Olympic gold. Badar-Uugan Enkhbat at bantamweight and Serdamba Purevdorj at light-flyweight will hope to become Mongolia’s first ever boxing Olympic champions. “I’m very happy and proud that two of our boxers could get through to the finals,” said Mongolian coach Bandi Damdinjav. Serdamba will face Zou Shiming, the third of China’s finalists, who as double world champion will start as favourite. Badar-Uugan will come up against Yankiel Leon of Cuba. Ever since this scuffle between Georgia and Russia began, I’ve been pondering what effect Russia’s new aggressiveness might have on other former Soviet satellites. In particular, I’ve wondered about the effect on Mongolia. ComingAnarchy.com has done an assessment of the issue and seems to come to the conclusion that, despite the commonalities that Georgia and Mongolia share, Mongolia will stay off the Russian imperialistic radar for some time. Mongolians realize that no outside power can project its power at the heart of Inner Asia forever, and the reality of living between two giant neighbors is something that Mongolia will arguably have forever. Of course, because Mongolia does not threaten the interests of Russia or China like Georgia threatened Russia (bypassing pipelines, American troops presence, NATO involvement, etc. ), both countries generally think of Mongolia as a strategic backwater. So Moscow and Beijing can be more generouis with Mongolia becoming close to the US, and its role as a buffer state won’t change—at least not in the eyes of Moscow. This was on four channels in Mongolia, but I don’t think it made the American broadcasts. Here’s the final match in 100- kg judo. Mongolian Matters reports on the massive celebration in UB of Mongolia’s first-ever Olympic gold medal. The rejoicing bonded even the estranged leaders of the MPRP and MDP. The president of the country walked down the steps of the government house holding hands with the prime minister and the leader of the Democratic Party. The blogger notes how large quantities of gold (mining rights) have divided the country, but how a very small amount of gold has brought them together. 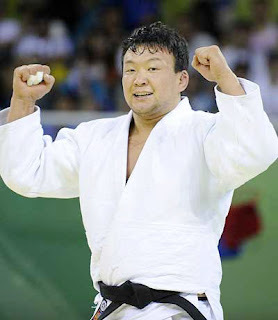 Mongolia’s Tuvshinbayar Naidan has defeated Ashkat Zhitkeyev to win the men’s -100kilograms class judo gold, the AP reports. Naidan had defeated the Japanese 2004 gold medalist in the first round before going on to eliminate fighters from Germany, Korea and Azerbaijan. This was his first Olympic competition; he had taken 5th place at the 2006 Doha Asian Games. Until 2000, Naidan was a wrestler, and he used a Mongolian wrestling move to drop his final contender. Although Naidan was five inches shorter than his opponent from Kazakhstan, he dove low and barrelled into Zhitkeyev’s legs. He was able to post three scoring blows by lifting Zhitkeyev off the ground and rolling him onto his back. That’s what Peter Morrow, CEO of Khaan Bank, claims about Ulaanbaatar’s retail sector, according to the UB Post. Morrow reports that, in 2000, the State Department Store was just a series of vegetable and meat stalls, while today, it is a thriving department store with high-end goods. If Mongolia’s mining sector takes off, the rest of UB’s retail business could follow suit. Investors are worried, though, in the light of recent unrest and the slow progress of mining in the nation. Next month, they will have an opportunity to address these issues at an economic forum in UB. Morrow insists that Mongolia is absolutely a good, stable place to invest. Mongolia’s GDP grew by at least 9 or 10 percent last year, as they begin to exploit the resources that Russia controlled for so long. The strong economy, proximity to China, and an ambitious promotion of tourism has put Mongolia on the business map, and international corporations are being drawn to UB. The fact that the nation is a late bloomer economically means that they have avoided some of the chaos currently plaguing the world market, such as the mortgage-backed securities that have played havoc with the U.S. economy. Still, Mongolia has some obstacles to address. First, there needs to be a clear sign from the government that they are ready to sign off on some new mining projects, something they’ve only done once in their 20-year independence. Second, the nation needs to convince investors that the July 1 unrest was an isolated incident and that the new government is ready to move forward. So far the Democratic Party has been able to stall the installation of the new Parliament, but Morrow and other investors are hopeful that this can be accomplished by next month. Morrow will be among those presenting at the economic forum, addressing these issues as well as environmental, legislative, and international trade concerns. Morrow is confident, though, that UB is a showplace that will convice investors by itself. “You can see the great vibrancy, the excitement of what’s happening here,” he says. Probably nothing earth-shattering will come out of this forum, but it will hopefully open international eyes to the great potential for investment in Mongolia.